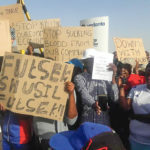 NEARLY three hundred Skorpion Zinc workers and community members on Friday staged a peaceful demonstration in front of the mine, expressing frustration over alleged exploitation of workers to maximise profits. A petition addressed to the office of the General Manager said they have taken note that Skorpion Zinc, and by extension the owners of the mine Vedanta Zinc International, are on a mission not only to exploit the resources in the country, but also workers. Southern Regional Chairperson of the Mineworkers Unions of Namibia, Allen Kalumbu, who read the petition on behalf of the group, said the issue started when the mine started terminating long-standing or established contractors and awarding upcoming contracts under the pretext of awarding such contracts to Namibians. “What we have learned is that Skorpion Zinc does not pay the same money to these new contractors, but pays them peanuts and these contractors accept these offers as they are desperate to penetrate the market,” said Kalumbu. 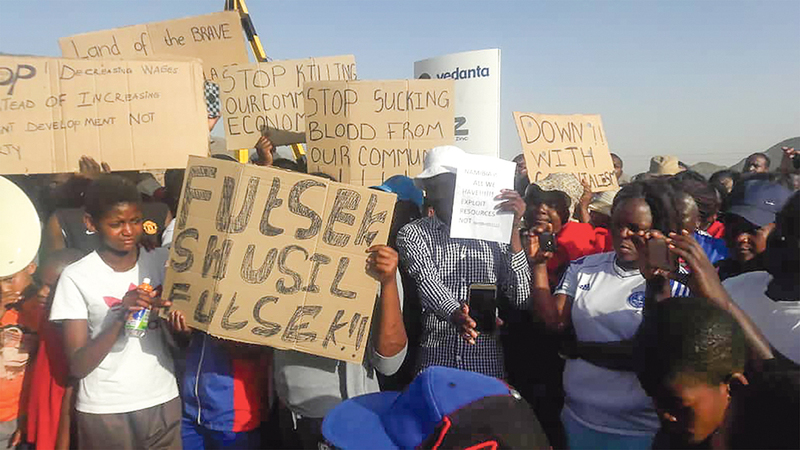 Furthermore, the group claims that Sushil Kumar, Company Head of Commercial, is behind the exploitation and has demonstrated on numerous occasions that he does not have the interest of Namibians at heart. The group demanded that Kumar be deported back to India. They also demand that Skorpion put up measures that will govern contractors to not exploit the employees in the name of maximising profits. They have given the Office of the General Manager until 31 October to act on the matter, vowing to take the next steps if the matter is not addressed. The petition was received by Skorpion Zinc Human Resources Manager, Patrick Chizabulyo.